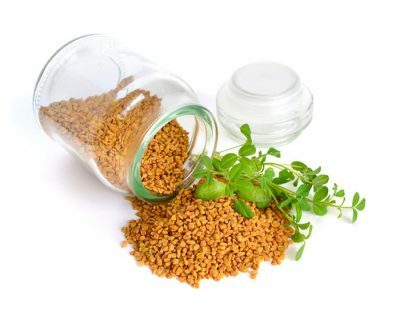 Fenugreek is very versatile but has been mainly used traditionally for mucous and lung congestion because of its excellent expectorant properties. It has been used for ulcers, digestive inflammation, gout and loss of appetite. It is one of the best herbs for encouraging breast milk. “Fenugreek is considered to be an aphrodisiac and rejuvenator. Traditional Chinese herbalists used fenugreek for conditions of the male reproductive tract, and a famous nineteenth century female reproductive tonic . . . contained fenugreek seeds. Fenugreek has mild estrogenic effects. Once fed to harem women to enlarge their breasts, James Duke says that fenugreek . . . really may do this. You can take it as a tea, he says, or massage fenugreek powder onto the breasts”. Today, burgeoning research is validating traditional claims and establishing new ones. As the traditional uses suggest, fenugreek benefits the female reproductive system in a number of ways. A double-blind study gave either 500mg of fenugreek seed husk extract or a placebo twice a day to 88 menopausal women. All of the women were suffering moderate to severe discomfort and were experiencing 3-5 hot flashes a day. The women who took the fenugreek had significantly greater improvement on the Greene Climacteric Scale. The women who got the placebo had little improvement: from 34.25 at the beginning of the study to 30.49 at the end; the women who got the fenugreek had significantly greater improvement: from 34.83 to 19.64. Hot flashes decreased by 47.8% on fenugreek, and 32% of the women who took fenugreek had no hot flashes at all. There was also significant improvement in night sweats (57.1%), insomnia (75%) and headaches (53.9%) compared to placebo. Vaginal dryness improved significantly more in the fenugreek group. Fenugreek was also superior to placebo for psychological symptoms. Mood swings improved by a significant 68.2%. Depression, anxiety and loss of sexual desire all improved significantly more on fenugreek. Compared to placebo, there was also a significant improvement in quality of life in the fenugreek group. The women who took fenugreek experienced improvements in physical and mental fatigue, concentration and interest in daily work as well as overall health, mental health and well-being. The fenugreek also reduced total cholesterol, the dangerous LDL cholesterol and triglycerides without lowering the heart healthy HDL cholesterol in women who had elevated cholesterol. As we will see soon, this additional benefit does not come as a surprise. In the fenugreek group, estradiol increased by 120% versus less than 5% in the placebo group. The researchers say that the increase in estrogen and the improvement in menopause symptoms “point towards the establishment of a healthy hormonal balance.” There was no toxicity and no adverse events in the fenugreek group (Phytother Res 2016;doi:10.1002/ptr.5680). Fenugreek also helps dysmenorrhoea, or painful periods. A double-blind study gave a placebo or 2700mg of fenugreek a day to 101 women with moderate to severe dysmenorrhoea. They took the supplement on the first 3 days of menstruation for 2 cycles. Pain severity was significantly less in the fenugreek group. Pain duration was also significantly shorter, and they used significantly less pain medication (J Reprod Infertil 2014;15:41- 48). Another hormonal problem fenugreek helps is PCOS. Women with PCOS suffer from 2 of elevated male hormones, infrequent or lack of periods and enlarged ovaries with lots of small cysts. 50 women with PCOS took 500mg of fenugreek seed extract twice a day for 3 months. The fenugreek seed extract significantly increased both luteinizing hormone and follicle stimulating hormone. At the end of the study, fenugreek had brought about a nonsignificant reduction in volume in the left ovary and a significant reduction in the right ovary. By the end of the study, 71% of women had regular menstrual cycles. 12% became pregnant during the study: an important improvement, since PCOS is the most common cause of ovulatory infertility. Fenugreek reduced cyst size in 46% of the women. 36% completely shrunk their cysts. Overall, 94% of women experienced improvement either from shrinking or eliminating their cysts, returning to regular menstrual cycle or becoming pregnant (Int J Med Sci 2015;12:825-31). Placebo-controlled research has also confirmed the ability of fenugreek tea to significantly increase breast milk (J Altern Complement Med 2011;17:139- 42). Fenugreek also helps men. It helps them stay young and sexually healthy. A double-blind study gave 600mg a day of standardized fenugreek seed extract to 120 healthy men. Compared to placebo, aftr 12 weeks, there was significant improvement on the Aging Male Symptom questionnaire, a measure of male hormone deficiency. Testosterone increased on the fenugreek compared to the placebo. Fenugreek improved sexual function, including the number of morning erections and the frequency of sexual activity. The researchers concluded that fenugreek is a safe and effective treatment for reducing testosterone deficiency and improving sexual function (Aging Male 2016;20:1-9). successfully managed by the drug sulfonylureas added fenugreek saponins or placebo, there was a significant drop in blood sugar and symptom scores on fenugreek versus placebo (Chin J Integr Med 2008;14:56-60). Adding fenugreek to bread reduced rises in blood sugar in a study of healthy people (Eur J Nutr 2016;55:2275-80). In the most exciting diabetes study yet, 140 prediabetics took 5 grams of fenugreek powder twice a day for 3 years or served as a control group. The control group had a significant 4.2 times higher chance of progressing to diabetes than the fenugreek group. The people who took fenugreek also had significantly greater reductions in fasting glucose and after eating glucose as well as in LDL cholesterol. They also had significantly greater increases in serum insulin (J Diabetes Metab Disord 2015;14:74). When type 2 diabetics were given 25g of fenugreek seed powder, there was a significant reduction in total cholesterol, LDL cholesterol, VLDL cholesterol and trigycerides (Phytother Res 1996;10:332- 4). Type 1 diabetics also benefit. 100g defatted fenugreek seed powder significantly reduces fasting blood glucose, total cholesterol, LDL and VLDL cholesterol and triglycerides. It also significantly improves glucose tolerance (Eur J Clin Nutr 1990;44:301-6). A small study found that, in people with elevated cholesterol, fenugreek seed powder reduces cholesterol, VLDL cholesterol and triglycerides (Indian J Pharmacol 2000;32:34-6). 42 people with Parkinson’s Disease who were on L-dopa and carbodopa added either placebo or 300mg fenugreek seed extract twice a day for 6 months in a double-blind study. Though there was no statistically significant difference, there was a clinically significant difference in the Unified Parkinson’s Disease Rating Scale and in motor score. In terms of disease progression, 21.7% of people on fenugreek went from a higher stage to a lower stage compared to only 5.3% on the placebo. The researchers concluded that adding fenugreek to L-dopa slows the progression of Parkinson’s (Phytother Res 2014;28:172-8). Previous articleDoes Too Much Turmeric Have Side Effects?